The bestselling author of A Man Called Ove and My Grandmother Asked Me to Tell You She’s Sorry returns with an irresistible novel about finding love and second chances in the most unlikely of places. When Britt-Marie walks out on her cheating husband and has to fend for herself in the miserable backwater town of Borg—of which the kindest thing one can say is that it has a road going through it—she is more than a little unprepared. Employed as the caretaker of a soon-to-be demolished recreation center, the fastidious Britt-Marie has to cope with muddy floors, unruly children, and a (literal) rat for a roommate. She finds herself being drawn into the daily doings of her fellow citizens, an odd assortment of miscreants, drunkards, layabouts—and a handsome local policeman whose romantic attentions to Britt-Marie are as unmistakable as they are unwanted. Most alarming of all, she’s given the impossible task of leading the supremely untalented children’s soccer team to victory. In this small town of big-hearted misfits, can Britt-Marie find a place where she truly belongs? 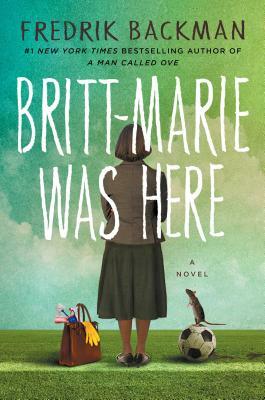 Funny and moving, observant and humane, Britt-Marie Was Here celebrates the unexpected friendships that change us forever, and the power of even the gentlest of spirits to make the world a better place. "Universal...Backman hits a nice note between overly sweet and hard-boiled fiction; excellent for book clubs." "Britt-Marie’s metamorphosis from cocoon to butterfly seems all the more remarkable for the utterly discouraging environment in which it takes place." “A brilliant mix of belly-laughs, profound insight and captivating events delivered… with Backman's pitch-perfect dialogue and an unparalleled understanding of human nature." “Even the most serious reader of fiction needs light relief, and for that afternoon when all you want is charm, this is the perfect book." "A light hearted, deeply moving novel about a grumpy but loveable curmudgeon who finds his solitary world turned on its head when a boisterous young family moves in next door. This quirky debut is a thoughtful and charming exploration of the impact one life has on countless others—and an absolute delight." "A Man Called Ove is exquisite. The lyrical language is the confetti thrown liberally throughout this celebration-of-life story, adding sparkle and color to an already spectacular party. Backman's characters feel so authentic that readers will likely find analogues living in their own neighborhoods." "Readers seeking feel-good tales with a message will rave about the rantings of this solitary old man with a singular outlook. If there was an award for 'Most Charming Book of the Year,' this first novel by a Swedish blogger-turned-overnight-sensation would win hands down."